I'm a few days late on this tidbit from DVD Drive-In, but this great news bears repeating even if you're already aware. The head of Synapse, Don May Jr., is a virtuoso at preserving and championing picture quality on not only his studio's output but also extensive restoration work on titles like The Texas Chain Saw Massacre and Night of the Living Dead. Given MGM's absorption into 20th Century Fox, Robert Young's Vampire Circus, along with the Fox-owned Twins of Evil, were speculated to be arriving in MGM's Midnite Movies double feature series. That obviously isn't happening and this situation is a much better reality for the feature and fans. I have no hesitation in recommending a blind pre-order on this BD/DVD combo given Synapse's excellent track record in the standard definition realm. 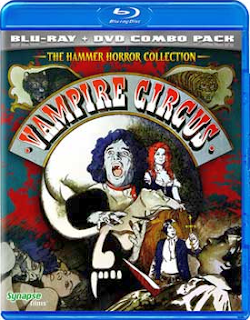 Synapse has officially announced to DVD Drive-In that they will be releasing the Hammer Horror classic VAMPIRE CIRCUS at the end of 2010 as a Blu-ray + DVD Combo Pack. This is the first time that the film has officially been available on disc in North America, and in stunning High-Definition. The SRP is $29.95. TWINS OF EVIL and HANDS OF THE RIPPER will be announced in the coming months for release some time in 2011. Blood-Curdling Special Features Include: THE BLOODIEST SHOW ON EARTH: “Making Vampire Circus” - An all-new documentary featuring interviews with writer/director Joe Dante, Hammer documentarian Ted Newsom, Video Watchdog editor/author Tim Lucas, author/film historian Philip Nutman and actor David Prowse; GALLERY OF GROTESQUERIES: A Brief History of Circus Horrors - A retrospective on circus/carnival themed horror productions; VISITING THE HOUSE OF HAMMER: “Britain's Legendary Horror Magazine” - A retrospective on the popular British horror/comic publication featuring author Philip Nutman; VAMPIRE CIRCUS: Interactive Comic Book" - Featuring artwork by Brian Bolland; Poster And Stills Gallery; Original Theatrical Trailer. The extras were produced by Daniel Griffith of Ballyhoo Motion Pictures. Wow! Those are great freaking news! These are the two films that are missing from my Hammer Horror Collection, and they are both excellent vampire movies!! !Im freaking Ha-ppy! Grrr... I'm just waiting for them to announce their release of 42nd Street Forever Volume 6. I can't wait this long for my fix. I figured that Brain Damage or Maniac Cop would be their first Blu-Ray but I have no problem with a Hammer title! He makes it sound like extras would appear on both the DVD and Blu-Ray discs. Also he has stated there will only be this one combo edition, so if you want just the DVD you have to buy this combo pack.